Two excellent books about birds and birding in southeast Michigan are The Birds of Washtenaw County, Michigan (1992) by Michael A. Kielb, John M. Swales, and Richard A. Wolinski, and The Birds of Dearborn: An Annotated Checklist (2007) by Julie A. Craves. 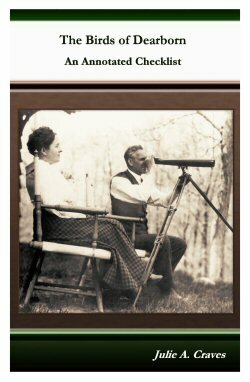 The Birds of Washtenaw County, Michigan (The University of Michigan Press) is no longer available at book stores. It may be possible to find used copies at internet booksellers. You can buy The Birds of Dearborn: An Annotated Checklist (2007) at http://www.lulu.com. When, if at all, is a particular species likely to occur in the county? How common (or easy to find) is that species and how does its frequency of occurrence vary during the year? In what kind of habitat will it be most likely to occur? What would be a good place in the county to look for it? The Birds of Washtenaw County, Michigan provides a comprehensive account of the birdlife in Washtenaw County. Situated to the west of Detroit in southeast Michigan, the county has an exceptionally rich history of ornithological study, fueled by the activities of numerous amateur birdwatchers and by the interests of two major universities. Frequency accounts of the 267 species recorded in the county during the last 15 years are framed by a discussion of the topographical history of the county. In addition, the authors present notes on another 30 species not seen in the county since 1976. A comprehensive site guide offers suggestions of the optimal locales and times to try to find the birds. Michael A. Kielb has studied birds in Michigan for over 15 years and teaches classes on birds at the Matthaei Botanical Gardens in Ann Arbor and the College of Du Page in Illinois. He also leads bird-watching tours throughout the Americas and is currently a Research Associate in the Reproductive Sciences Program at the University of Michigan. John M. Swales first became interested in birds while teaching in the Sudan and has been exploring the birdlife of Washtenaw County since arriving at the University of Michigan in 1985. He is Professor of Linguistics and Director of the English Language Institute, University of Michigan. Richard A. Wolinski has been studying the birds of Washtenaw County for nearly two decades. He is a staff biologist with an engineering firm in southeast Michigan. The Birds of Dearborn: An Annotated Checklist can be bought at the River Rouge Bird Observatory web site store. In partnership with Lulu.com, RRBO benefits from books purchased at the RRBO web site. This book, The Birds of Dearborn, An Annotated Checklist, represents essentially an entirely new publication [following The Birds of Southeast Michigan: Dearborn, Wayne County (1996)]. Many of the original 50,000 records that were compiled for The Birds of Southeast Michigan got a second look. If the documentation for a sighting wasn't convincing, given another decade of experience with local birds, the record was set aside. Historical records were re-evaluated, which included examination of maps not previously accessed and another search of old literature and unpublished material. Thousands of additional bird sightings and nearly 5,000 new banding records were added to the mix. The results? Revisions of temporal data for 175 species -- the majority of the species found in Dearborn. Eight new species have been added in the last ten years. One was the result of a taxonomic split (Cackling Goose). Completely new are Tricolored Heron, Gyrfalcon, Sanderling, Lesser Black-backed Gull, Varied Thrush, and Blue Grosbeak. Dunlin is also "new." It was previously listed as a historical record only, but we now have two contemporary records. This book also includes "typical" arrival and departure dates in addition to extreme dates. . . . Other new features include more out-of-state banding recoveries, longevity records based on banding recaptures, graphs depicting the 15 most banded species by season, a bibliography that includes reprints of a number of papers on interesting Dearborn bird records, and a smattering of photographs. Although focusing on Dearborn, the status, relative abundance, and temporal data should be representative for much of southeast Michigan, especially for species that are most intensively surveyed in the city (such as songbirds). Thus, The Birds of Dearborn is valuable resource for local birders. The Birds of Dearborn: An Annotated Checklist - A complete revision of The Birds of Southeast Michigan: Dearborn (1996), with ten years of new material covering 263 species. Includes guides to birding locations in Dearborn, with new maps of the city and University of Michigan-Dearborn trails; more information on birds banded on the campus by RRBO; and a very handy table of "typical" arrival and departure dates for migratory birds to complement the extreme dates provided for most species. Julie Craves has been supervisor of Avian Research at the University of Michigan-Dearborn's Rouge River Bird Observatory since 1992. Her work has been recognized by awards from the Detroit Audubon Society, Friends of the Rouge, and the University's Office of the Provost. In addition to authoring The Birds of Southeast Michigan, Dearborn in 1996, she has contributed to several other books. She was editor of the state journal Michigan Birds and Natural History for six years and has also written numerous articles in the popular press. She has been a Contributing Editor to Birder's World magazine since 1999. Go back to the main page of Southeast Michigan Birding web site.